As if the last 1000 years of Western innovation means absolutely nothing, there is not anything more that Chinese professors and teachers love to brag about and lecture extensively on then China’s Four Great Inventions (四大发明 sì dà fāmíng). 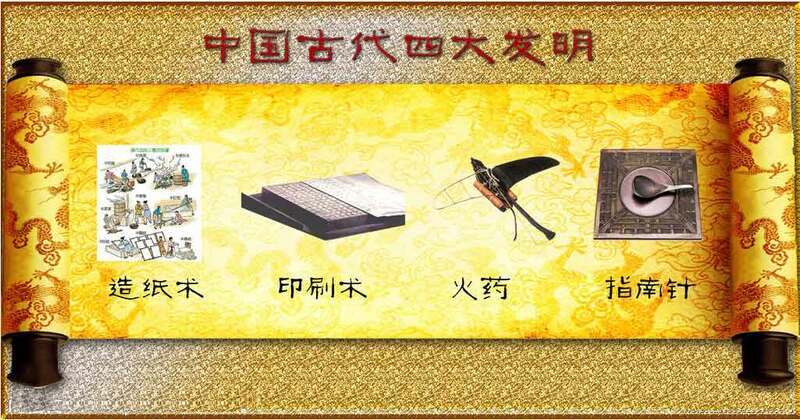 These inventions are directly related to Chinese scientific development, and they are ancient Chinese inventions that have made an impact on the globe. In the classroom, all students in China are required to memorize these inventions, and when the teacher mentions the Four Great Inventions, the students are expected to say them out loud together. Students themselves may criticize this list, saying that in comparison to the West, these are not great inventions. They suggest that creations like the computer, the aircraft carrier, and nuclear engineering among others are much greater and that all the Chinese have to celebrate is something over 1000 years old, like making paper. Right now, China doesn’t have the capacity for being innovative with its industry-oriented economy and largely conservative leadership. Approximately 50% of China’s economy is tied into industry, and the average age of China’s heads of state are around 60 years old! In the Chinese society, elders are revered as being wiser and more capable, and thus, are the only candidates for top leadership positions (there’s a Chinese Mark Zuckerberg out there, but we’ll never find out.). Additionally, the Chinese education system lacks the ability to teach students innovation; however, this is a subject for another day. I was completely ignorant of the Four Great Inventions or the need to possible update the list. Great post!